Discussion in 'Calibration, Help, and Troubleshooting' started by Syko_Symatic, Mar 9, 2016. I have noticed that the IR Sensor is lit constantly when at home. 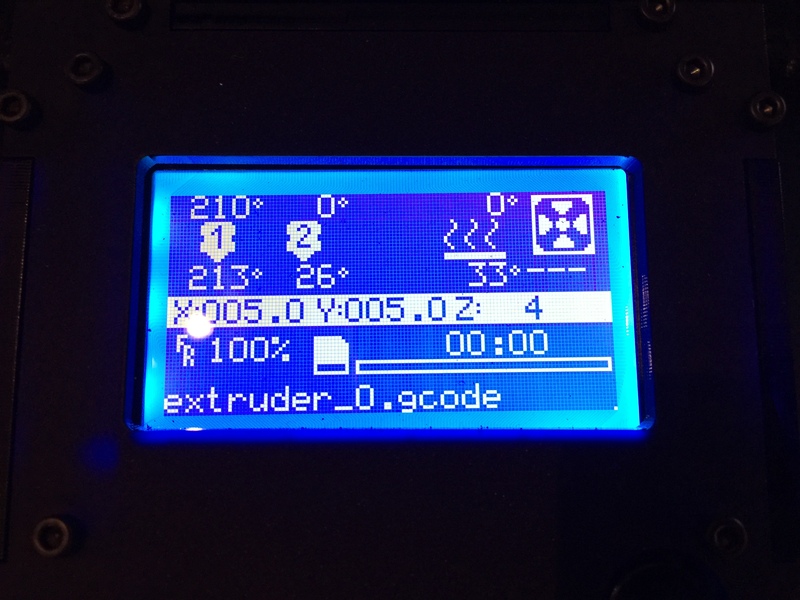 Does the extruder_0 gcode, simply heat up the extruder? Have you tried to run the Benchy? Yeah I have tried benchy but exactly the same thing happens. I am following the build guide instructions but have just hit a brick wall with this one. Hmmm it's like it is waiting on something... What about trying your own print? I would imagine it would do the same thing. Also I believe the IR sensor would be red after it homes, Can you move the axes manually using the LCD? Yes, everything moves fine until I go to print. I agree, it is almost like it is waiting for the go signal but nothing comes! Arrggghhhh! Tearing my hair out! Does the extruder temperature fluctuate pretty wildly above and below, like go 3 degrees above, then 3 degrees below? That may be the problem, if it doesn't see a steady temperature, it won't start. However, I am not sure how to dial in the PID, I have read some people needing to do that. The bed PID tuning is disabled in the firmware by default if I'm not mistaken. So I have dialed in the PID to hover at 1 deg below or blob on. Still nothing?! Any ideas how to get it to sit above the temp? Hmm.. we are venturing into where I have little knowledge.. I am not sure why it won't print, you could send greg a message on the forums and ask him, or if anyone else has an idea..? I have sent Greg a message. I might be able to give them a ring and annoy them personally tomorrow. This is killing me. It's bound to be something daft! Does anyone else out there have a solution? I'm waiting on a heated print bed that got stuck in transit due to weather, the frustration is real. I just can't believe that with minimal issues I have managed to get to this point. All the motion works perfectly but I can't get it to print. I just don't understand it. Waiting on the bed must be a pain but at least you will have all this bit to look forward to! Can you paste the gcode here? @Syko_Symatic Have you tried plugging the BB into a computer to see what S3D reports? I'm sure you've done this already, but have you tried powering off and on? I have had a few weird thing and off,count to ten, on has resolved a few. @PsyVision I have the OctoPrint upgrade so technically can't connect directly and still have to finish setting it up. @Spoon Unit Yes I have tried that one. A few times but just get the same result unfortunately. @elmoret the GCode is the sample code from the supplied SD card, I have not modified it in any way. The sample code has changed over time IIRC, can you post it here please? Can you post a picture of the backside of the printhead ? Maybe the printcoolers are to far down, or the heaters / Pt100's are not positioned right. This could explain the big jumps in temperature.